CellTech and Insulin - What Does It Matter? In part I of our MuscleTech Cell Tech Review, we briefly mentioned the importance of insulin and how it's connected to Cell Tech's formula design, now we'll take a closer look at insulin and how it plays an important part in Cell Tech's formula and the crazy 75g of dextrose per serving in CellTech. ;-) I know a little (the basics) about insulin and how it works, but I'm by no means an expert on this topic, but let's just go over some basics about insulin, and you'll see how it works with CellTech. Insulin is actually a hormone secreted by the pancreas in response to changes in your blood sugar levels - so its very much dictated by the foods you eat. A lot of cells in your body has these insulin receptors that binds to insulin when its in circulation, and these receptors absorb the glucose from the blood into the cell. Since insulin is so closely tied with glucose (blood sugar levels), you can imagine how much you can affect your insulin levels thru the foods you eat. Now you're probably wondering what the heck does insulin have to do with Cell Tech? Simply put, MuscleTech designed CellTech to cause a surge in your body's insulin levels (a insulin spike) to make creatine absorption into the cells much more efficient. And it works. To understand this, you need to know that there are 2 types of carbs, simple carbs and complex carbs - actually, there's something like 5 kinds of carbs as said in part I, but to keep it simple, we'll just use simple and complex carbs. 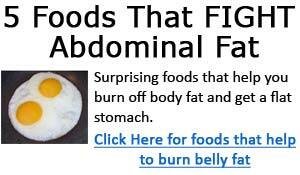 Simple carbs - as the name says - is in its most basic form, and requires no further digestion when ingested. Dextrose, used in Cell Tech, is a simple carbohydrate. Complex carbohydrates, needs to be digested and broken down before they can enter the blood stream - hence, complex. Bread, pastas, and rice are some examples of popular sources of complex carbohydrates. So what's the big deal about dextrose being a simple carbohydrate? Each serving of Cell Tech contains 75g of dextrose (sugar), and as said before, when simple carbs are ingested, they need no further digestion and is quickly absorbed into the blood stream. So you can imagine that with every serving of CellTech you take, the 75g of dextrose gets shot into your blood stream very quickly. So what happens? Your blood sugar levels go thru the roof, which triggers a huge response from your pancreas - making it release insulin like there's no tomorrow. (ok that's a little exaggerated, but you get my point) This is what's called an insulin spike - it's actually quite unhealthy - as you can imagine, any sudden changes in your body can't be good for you. All the insulin is released to quickly bring your blood sugar levels back down to normal, since your body wants to maintain its blood glucose at a very stable level. The insulin then, force feeds all the excess blood sugar into the cells, bringing blood sugar levels down to normal. So how's this related to CellTech and creatine absorption? During this forcing of blood sugar into cells, the creatine "piggy backs" on to this process and is also shoved into your cells, making its absorption both quick and efficient. Essentially, Celltech is just creatine monohydrate with a lotta sugar added in, and a whole bunch of other stuff. 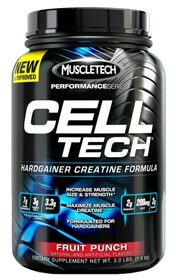 When I took my CellTech I experience no side effects of any sort - it's just creatine after all. Of course, you can expect some of the usual side effects of creatine if you over do it like gastro pains, and upset stomachs. But I highly doubt anyone will over do it with CellTech considering its hefty price tag. Also, because of high amounts of dextrose in cell tech, people with diabetic problems should seriously talk with a physician before they use this stuff.